Using the correct temperature wax applied to the top deck of your surfboard can make the difference between catching rides all day, or swimming. Waxing your surf board properly is essential to maximizing your surfing skill. The first thing to consider is what kind of wax to buy. Warm or cold water wax is important, using wax intended for the opposite water conditions can cause you to slide right off your board, which is exactly what you will do if you don't have any wax on your board. Water temperatures are printed clearly on the outside of the package, simply be aware of the water temperature where you will be surfing and the corresponding recommended temperatures on the package. A tropical temperature wax will be the hardest composition to resist melting, where as the cold water temperature wax is the softest for easier application in cold climates. Once you have your wax, you need to get the old wax off your board. ( For a new surfboard we recommend a base coat first. ) The easiest method is to lay your board out in the sun so that the wax already on the board softens. Once it softens, scrape it off gently with a wax comb like "sharkbaitsurfwax flex wax comb" made for just that task and sold at surf shops. If you don't have one of these combs, a plastic scraper or old credit card will work, avoid using metal tools, they will scratch fiberglass. Use a wax remover and cleaner like "sharkbaitsurfwax wax remover", an all citrus-based solvent that rinses off with water to remove old wax and dirt. 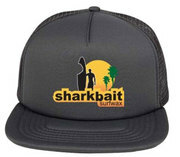 "sharkbaitsurfwax" is the stuff that makes your feet stick to the top of your surfboard and helps prevent surfers from becoming shark food. It's a good thing. 1. Understand that different kinds of surf wax are made to work in different water temperatures. Buy surf wax that is suited to the water conditions you surf in. 2. Consider using a base wax to prolong the effectiveness of your grip waxes. A base wax is the hardest composition surf wax and has the best adhesion(stays on your board the longest) to fiberglass and epoxy. Applying a base coat first allows the softer grip waxes to adhere to the top deck of your surfboard better without pushing off, which means your grip wax will stay where it does the most work. 3. 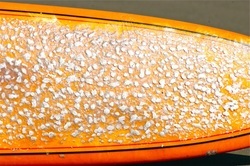 Rub wax onto the "deck," or top, of your surfboard using 3- to 6-inch circles. It's not necessary to use a lot of pressure, the wax will apply with light pressure. 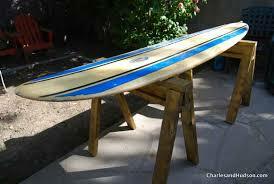 Pay particular attention to the parts of the deck where your feet will be, and wax the board all the way to the tail. 4. Note that you don't need to wax the extreme front of the deck, but put some wax at the spot on the top side of each "rail," or side of the board, where your hands grab the board to sink the nose when you duck dive. Use a circular motion to apply the wax. Put a heavy coat of wax on your board every time you go surfing while you are learning. If you are wearing a wetsuit, you can tuck a small bit of wax into the calf of your wetsuit so that you will have it handy if you need to rub a little onto your board while you're in the water. Once you have a thick coat of wax on your surfboard, you can use a stiff comb to rough up the wax for an even better grip. Anticipate where you will stand up, and where on the rails you will push up with your hands and make sure to apply extra wax in these locations. Remember, there's no harm in putting wax somewhere and ending up not needing it. Better too much wax than not enough. When you are done applying the wax, spray some cool water over the surface of the board so that the wax cools and hardens and stays on the board. Some surfers like a softer wax like a cold or cool, even in warm or tropical waters. You can protect or cover a softer wax by lightly waxing over the cooler temperature wax with a hard warm or tropical wax, which helps prevent the softer wax from pushing off or rubbing on to you.